Last night I had a dream that I was offered a job at Vogue. It was all very specific. The position was “Creative Assistant.” At almost 36, I’d like to think I am far beyond an assistant role, but it was Vogue, and in my dream, it sounded just fine. The salary was $87,500. I had to start, in New York, on Monday (it was a Thursday). It meant uprooting my family to live off pennies by New York standards, and having a very demanding schedule and role that would undoubtedly fulfill me creatively and professionally and drain me on a personal level. I was so torn in the dream about whether or not to take it. My dad said no. My best friend said yes. It wasn’t the move or the salary or the title that factored into my decision-making, though all those things scared and intimidated me. It was that I had been offered a job at Vogue. Finally. That I knew I could bring so much to that creative assistant position. That I had so many ideas running through my mind already. That I could picture myself walking into that office every day, fulfilled. And very likely a little drained. Back here in real-life this morning, I woke up and poured two bowls of cereals and handed out gummy vitamins. I answered a few emails, checked my Instagram and took my time getting ready and shuttling Kai off to preschool. I will work for a few hours and then head over to Little D’s school where she is being awarded with student of the month. Then a little more work, pick up, and a playdate with some friends. I have been struggling so much over the past year with what my next chapter will be, on a professional level. I am beyond blessed to have a thriving freelance business that lets me balance motherhood and career with flexibility, on my own terms (for the most part). It’s a dream set-up for most working mothers, especially when your babies are little and need you so much. But my babies won’t be babies forever and as it turns out, I am not just a working mother who wants to – or needs to – work. I want to do amazing things with my career. I want to work with brands and people that are at the top of their game. I want to feel inspired and motivated and driven by my work. I don’t have any interest in working simply for a pay check – I want to work for me. And I want to work hard and do great things and have a creative assistant of my own. So many women talk about feeling torn while trying to juggle work and motherhood. But what if it’s not society tearing you up, it’s yourself? What if you’re the one putting the pressure on yourself to have it all, strive for more, aim a little higher. And you don’t feel bad about it? Is the grass always greener? Absolutely. If I were to give up the flexibility of my business for a more corporate position with a dream company, surely I would find plenty to complain about. But if I stay on the path I’m on, will that dream job remain nothing but a dream? Will the awards ceremony make up for that? Each and every time? I woke up before I made the decision in the dream. Of course. I don’t know if I took the job at Vogue or not. And I don’t know what decision I will make in real-life or not. For now, I will continue exploring all my options, enjoying pick up, being front row at every awards ceremony, and doing the best work I can in the business that I have. Until I wake up with a clear decision in mind. After all…isn’t life but a dream in the end anyway? 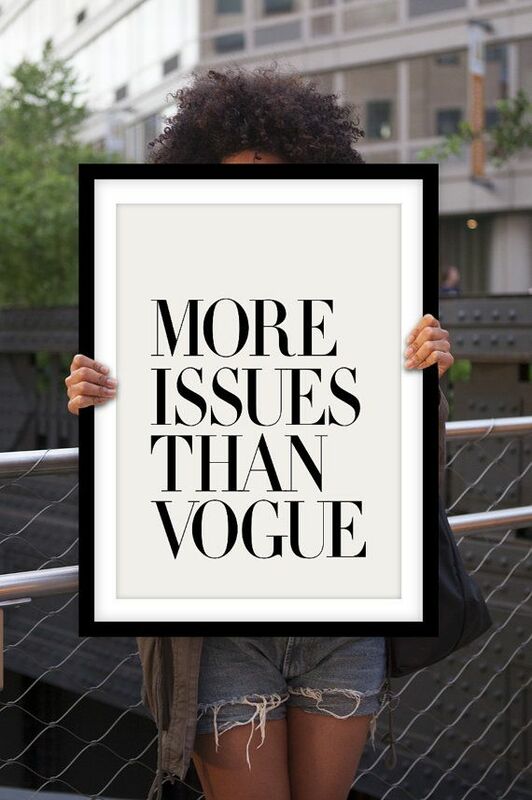 I really want this print (More issues than Vogue)! I’m on a clever sayings, print kick. Aside from the print, I’m on board with you in regards to a dream job. I am currently working for a paycheck and letting all my creativity slowly become hobbies, instead of a career. The thought of a pay cut and a dream job where I wake up to be inspired, doesn’t sound half bad right now. Thanks for the reminder to take a moment to review priorities and passions. Great post. I’m young, but for some reason I’ve been so completely hung up on this lately. Trying to figure out what I want my dream job to be. I have NO idea. Lots to learn, but your statement about wanting to work hard and do great things really struck a chord. Also, on a funny note, I texted my husband this morning to let him know that I had a dream last night where I won a date with Tom Brady. Too funny! He asked if I made a ‘move’ and I said no, in fact I asked for an autograph for my husband- what a missed opportunity! I so identify with this – no question that the worst mommy wars of all are in my own head.